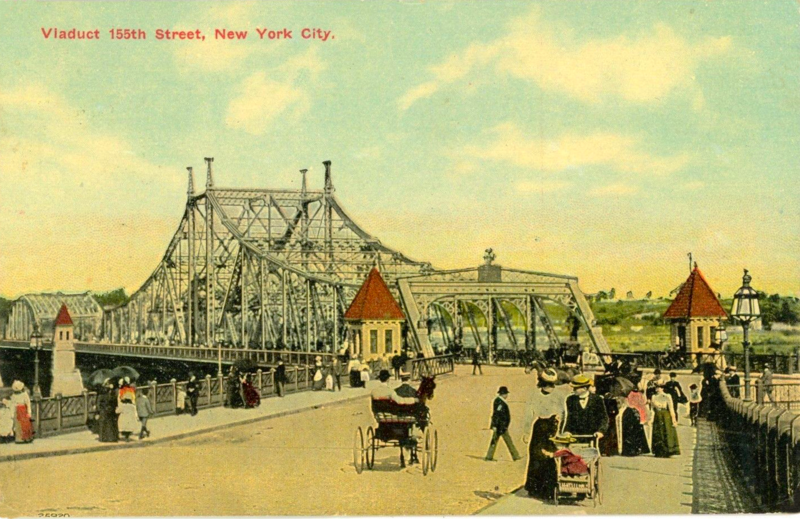 It looks like a country scene: a slender iron bridge, green bluffs across the river, groups of women strolling while shielding themselves with straw hats and sun umbrellas, a couple wheeling a child in a stroller, two men in a carriage led by a single horse. A Midwestern village? Actually it’s 155th Street on the Harlem-Washington Heights border circa 1900, after the Macombs Dam Bridge opened in 1895 and before this section of Manhattan attracted industry, traffic, and a tidal wave of new residents looking for space and better housing. The wonderful thing is that Macombs Dam Bridge still stands today, flanked by the same stone sentry towers.